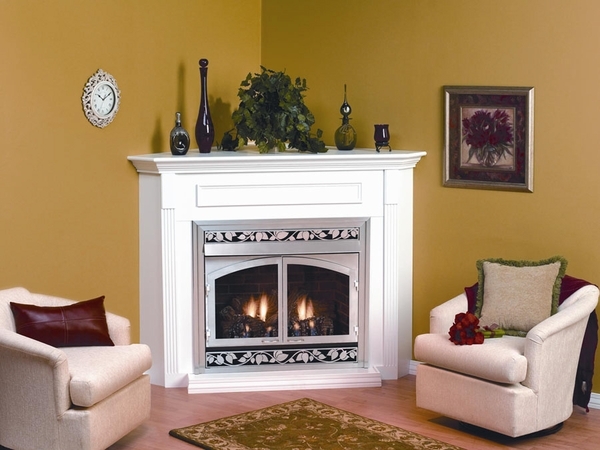 Cabinet Depth - 30 1/8"
Corner Depth - 27 7/8"
This corner cabinet is a combination of mantel, surround, and base and is appropriate for installation for 24" Vail fireplaces. It is constructed with cabinetry-grade materials as well as solid wood trim and full 3/4" moldings. The unit comes with a hand-applied finish in colors of cherry, nutmeg, white, oak, and dark oak. It also is available unfinished. The dimensions of the cabinet are 38-1/2" H, 40-5/8" W, 30-1/8" cabinet depth, and 27-7/8" corner depth. Can this be fit with an electric insert? It is made for a gas unit, but there is no reason that an electric unit can't be fit into that mantel depending on its size. I am interested in this fireplace, however, I have a few questions to ensure it will fit in my space. What is the depth of the top (from front to the back corner of the top mantel)? What is the width (from corner to corner of the top of the mantel)? What is the total height of the mantel? Do the front doors come with this item? The full shelf width is 42.5". The depth from the front to the back of the mantel shelf is 24 5/8". The height to the top of the mantel is 38 1/2". The doors shown are in the accessories section of the fireplace you will purchase with the mantel. Can this be used with direct venting fireplaces? This mantel cabinet is only tested and listed for use with Empire's 24" Vail vent-free fireplaces, and we cannot guarantee that a direct vent unit will fit properly with the necessary clearances.